Wheat disease updates are written by OSU Extension Plant Pathologist Dr. Bob Hunger and posted on the World of Wheat blog. Oklahoma: A couple of “firsts” occurred this week. 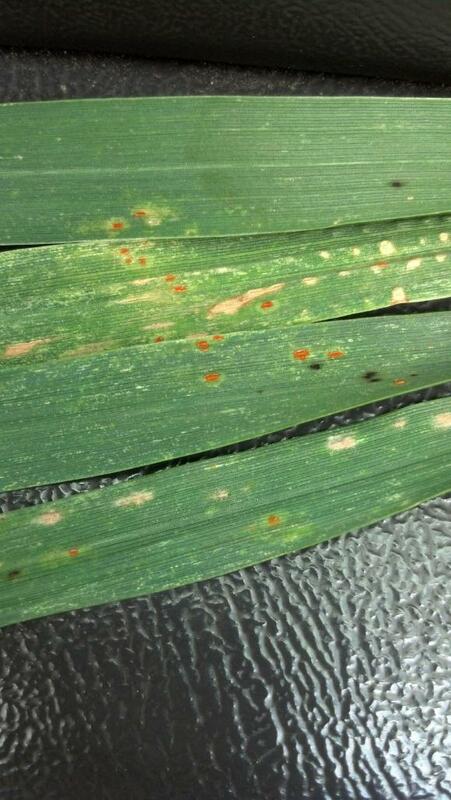 Mark Gregory (Southwest Area Extension Agronomist) reported the first leaf rust in Oklahoma for 2013 (see photo below). It was on Overley near Devol, OK, which is near the Red River north of Wichita Falls, TX. The wheat was at GS 10-10.1 (boot to heads just emerging), and was in a field with quite a bit of damage from the freeze. From Mark’s description, the prevalence was fairly low as he indicated he had to look around quite a bit to find rust pustules. Along these lines, Dr. Jeff Edwards and I recently updated “Foliar Fungicides and Wheat Production in Oklahoma – April, 2013” (OSU Current Report CR-7668). This publication provides answers to many of the common questions typically asked about wheat foliar fungicides and provides a table listing the most common fungicides available to control wheat foliar diseases. You can find the publication at http://www.wheat.okstate.edu or by clicking here. We also had our first confirmed sample of wheat streak mosaic in Fuller wheat from southwestern OK (near Sentinel) in Washita County. This was in a field that had been sprayed for volunteer wheat last fall. Perhaps sufficient time was not allowed to elapse between the spraying of the volunteer and the planting of the wheat in the fall – remember, two weeks should be allowed between the complete death (not the spraying) of volunteer wheat and the emergence of seedling wheat in order to kill the wheat curl mites that transmit Wheat streak mosaic virus. Next week I’ll be looking around more of the state for diseases – thankfully it is too rainy today!!!! By osuwheat in Bob Hunger, disease, wheat on April 10, 2013 .